Redmond ® Mineral Trophy Rock | Florida Farm & Feed, Inc. 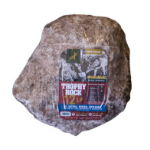 The Redmond ® Mineral Trophy Rock All Natural Mineral Lick is a great way to provide deer with all the necessary nutrients and minerals they need. It contains over 50 minerals including calcium, potassium, phosphorous, sodium, iron, aluminum, zinc, manganese, barium, and strontium that help to provide deer with a balanced diet. This all-natural Trophy Rock provides deer with the nutrients they hunger for and need.